Most people prefer gardening through potting. If you want to give this gardening style a try, you may also want to choose a garden potting table. This table can be just an old woodern bench or a discarded dining table. The best outdoor table designs are those that would look natural in the presence of the plants and flowers. There are several garden table designs that you can choose from, the important thing to keep in mind is to pick one that would be able to accommodate all the pots of plants that you have. 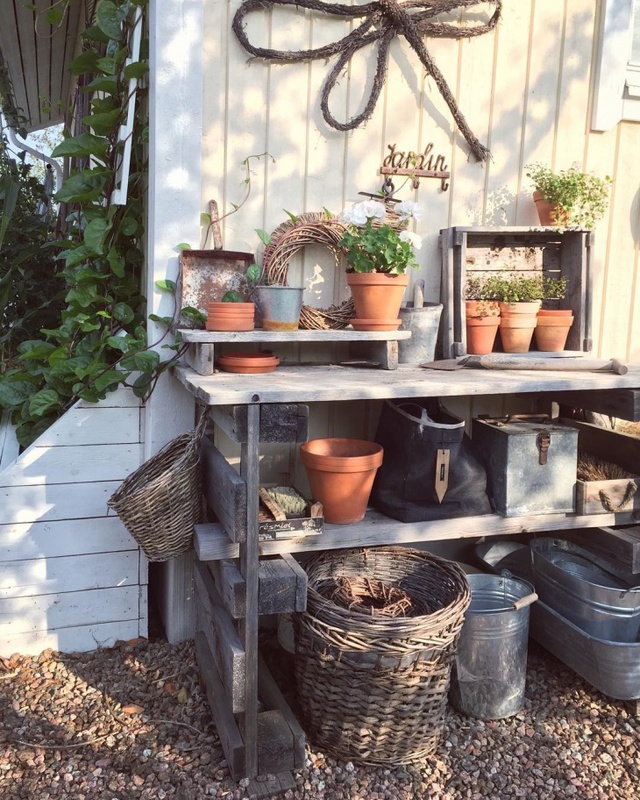 This is a good example of a potting bench. 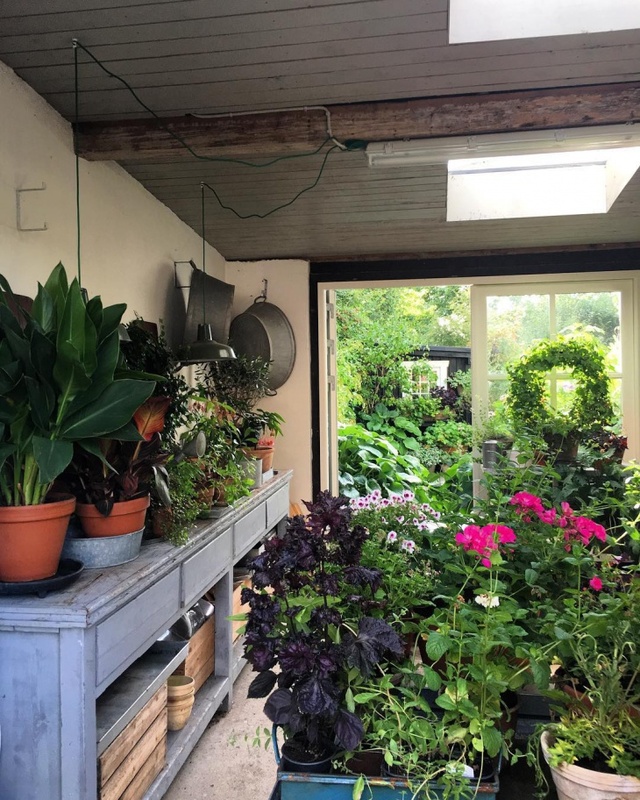 It has a rustic design and the our levels of shelves allow for sufficient display area for the pots with extra space for other things like the unused pots, watering can and decorative pieces. 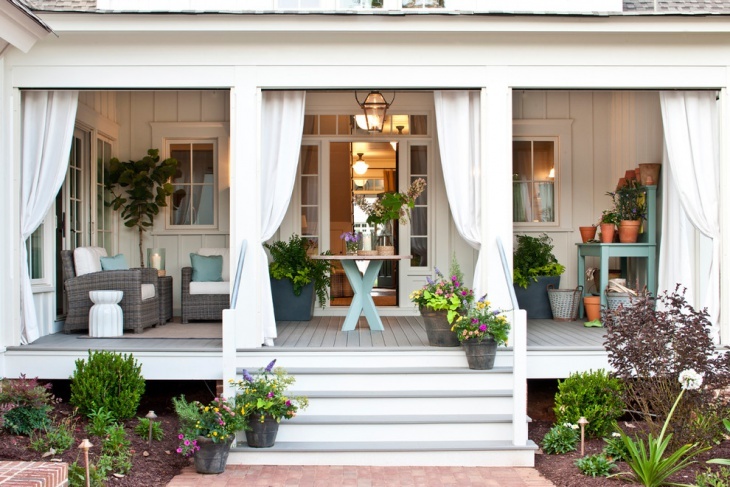 Even if your outdoor space is not big, you can still have a nice and beautiful garden by using a potting table. This garden table is ideally positioned in a small space, providing a chance for nature to exist even in a crowded area. 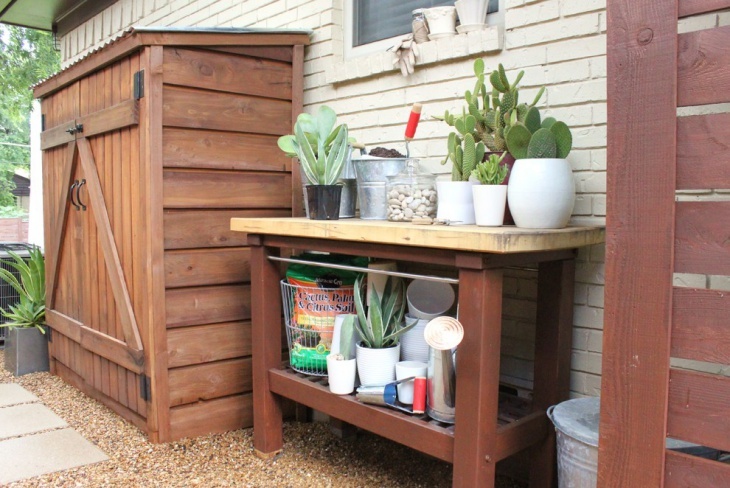 A potting table or bench can also be used as an additional outdoor storage, just like this one. 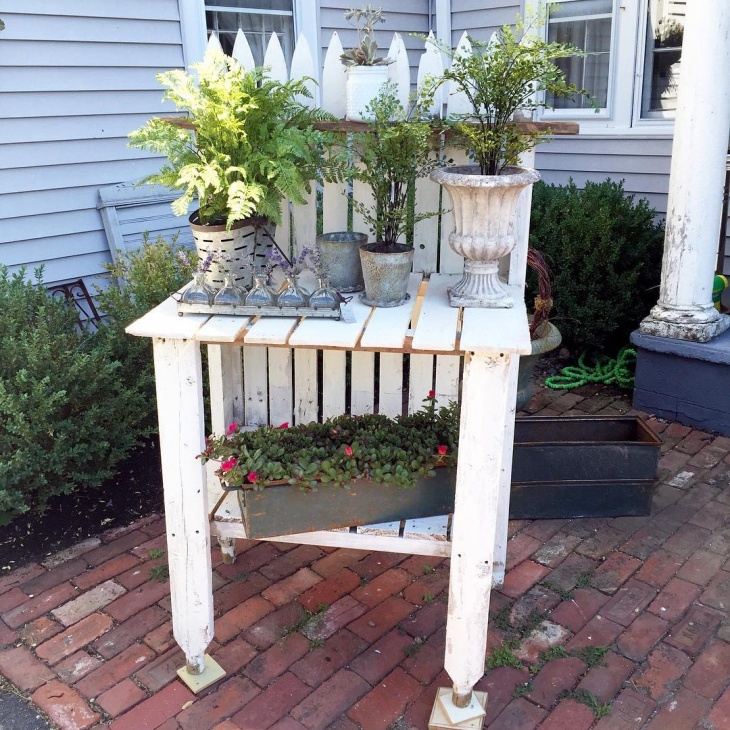 The table top is used as the display space for the pots while the lower deck provides a useful storage area for assorted gardening items, tools and necessities. Some people just love gardening that they would make sure they can do this hobby even when living in highrise apartment buildings. 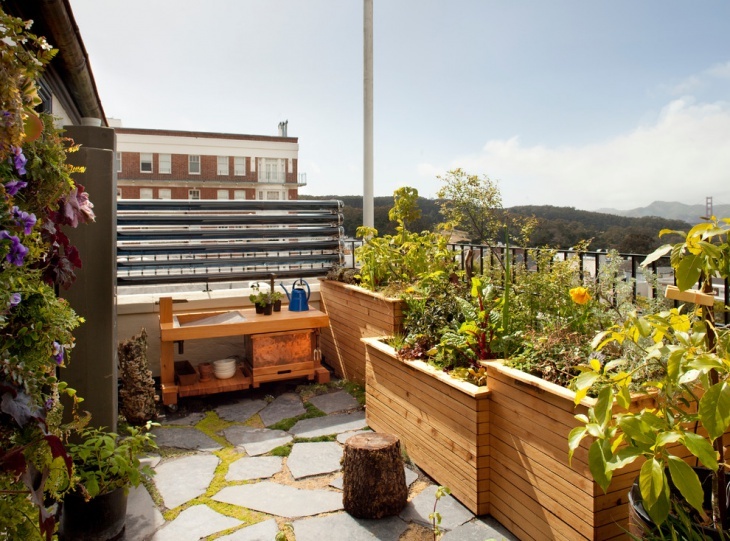 If this is your living arranagement, then you will find this balcony garden. 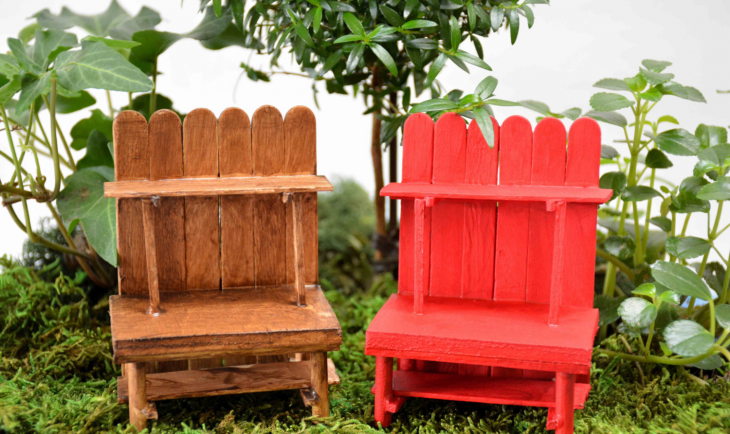 The beauty of wood is used to its advantage through the small potting bench and the tall garden containers. 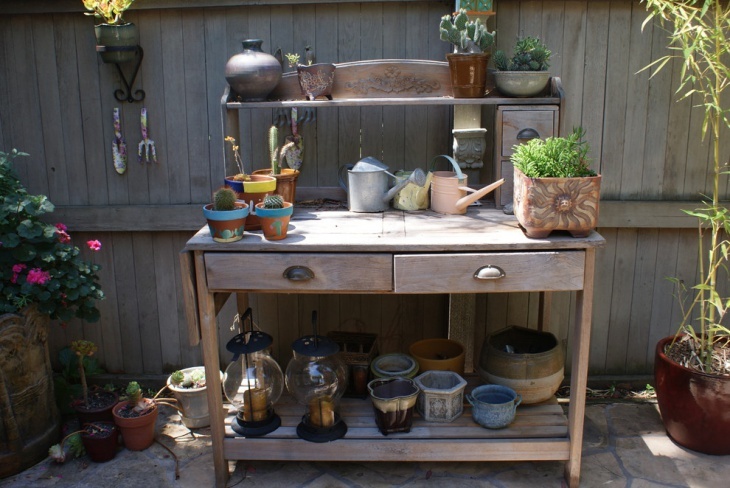 If you have an old dresser or office desk, you can easily turn it into a DIY potting table with a rustic appeal. 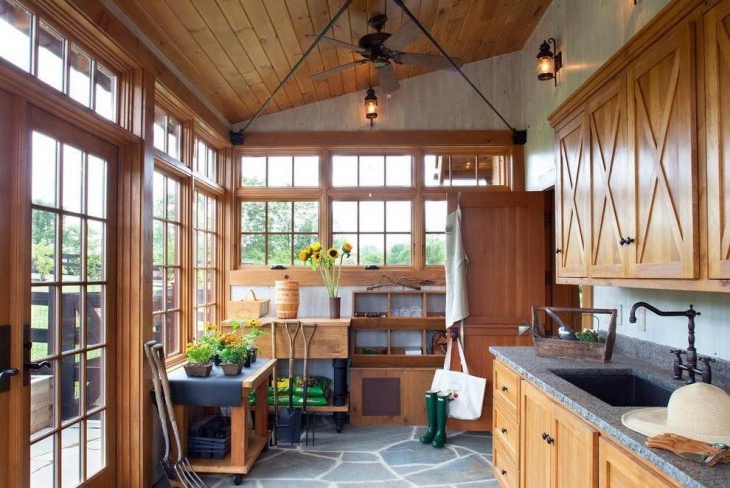 The best idea is to keep the look unpolished and to keep the drawers for storing small gardening tools. In creating a garden bench or table, you can use one of the many nice dining table designs, or you can stick with the basic rectangle. This table, for example, looks very simple and it fits perfectly into the garden shed design. 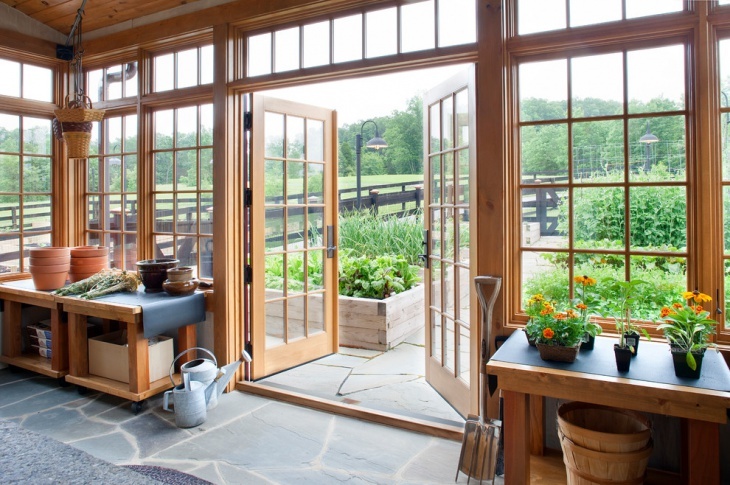 A vegetable garden can be started inside a shed, all you will need is enough space and a sturdy and functional wood and metal potting table. 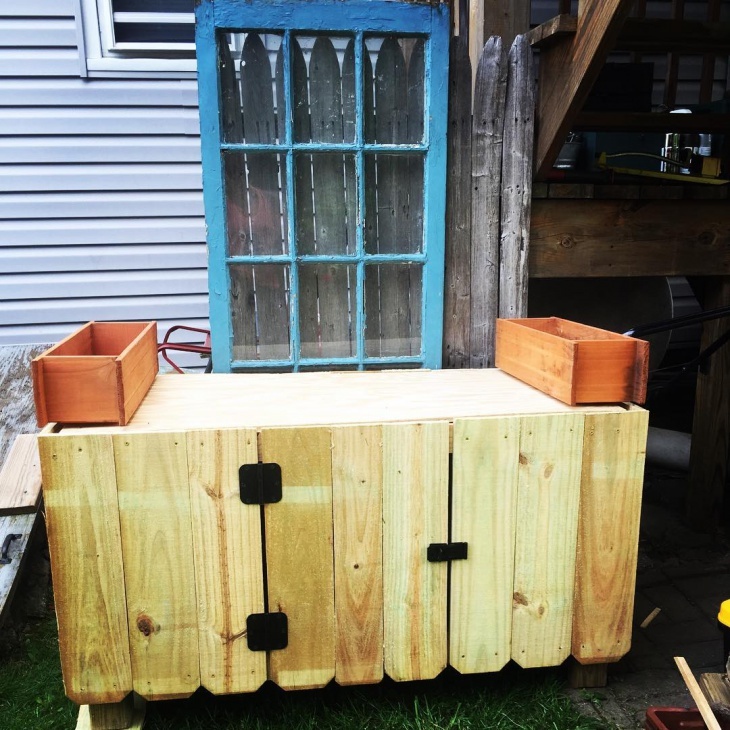 Add a sink and some shelves into the design and it will result in a great garden shed. 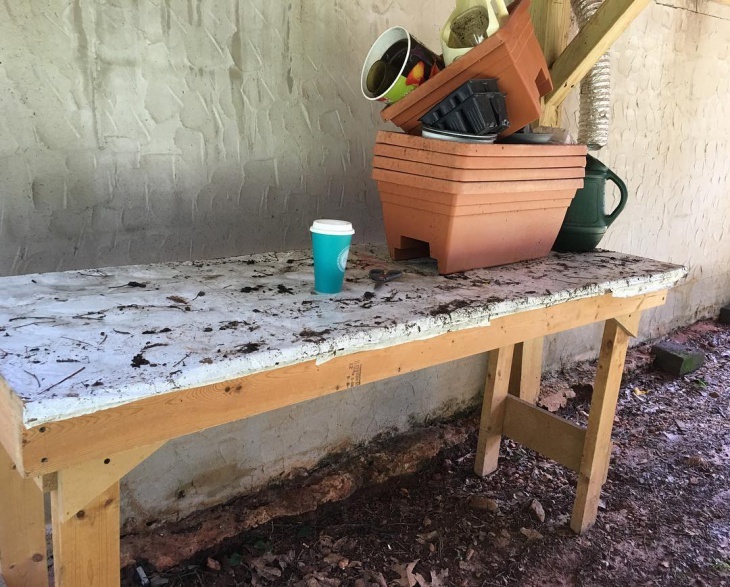 Using an old piece of wood as a table top is a practical idea if you want to create a functional space for your potted plants while saving money at the same time. Who says a potting table is only for displaying potted plants? 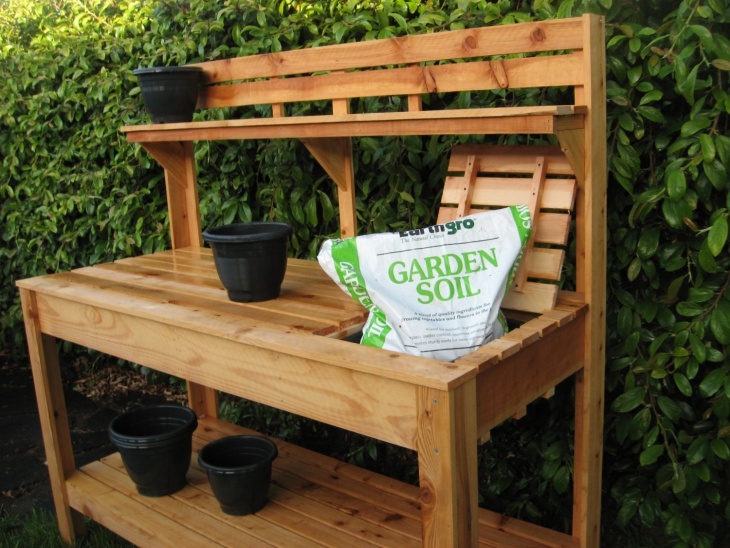 If you are jst starting on your potting activities, you can use your potting table as a space to store the pots and to put some soil. This means that you can use the table as your working table. There are several accessories that make up a garden. One very functional and unique accesory is a potting table. 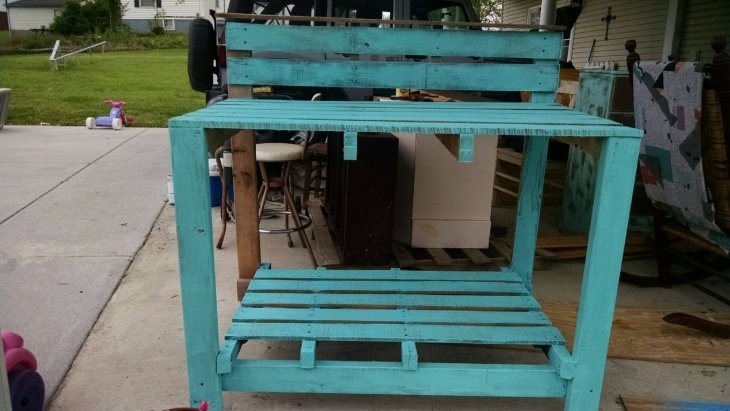 This can be a simple bench in rustic coffee table designs or dining table styled potting table. 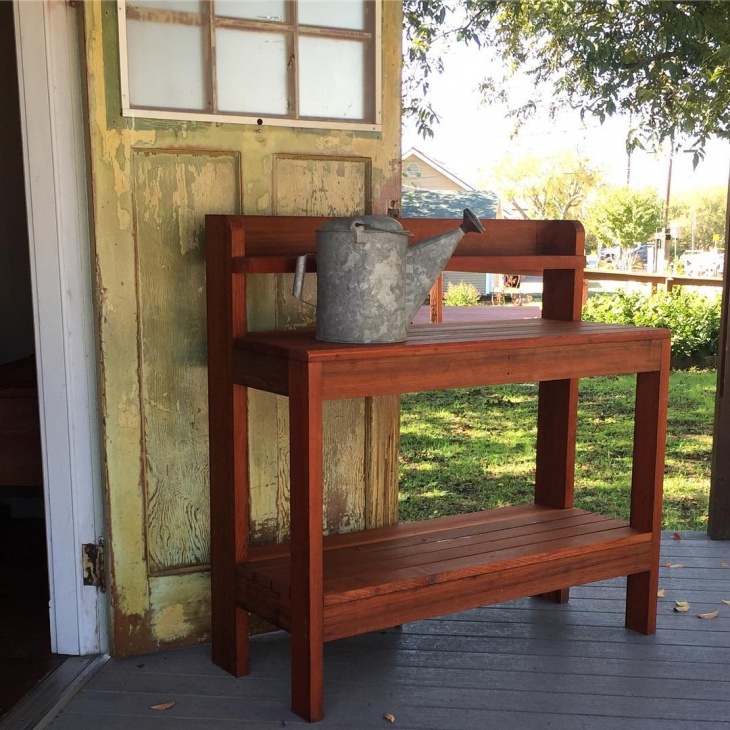 The important thing is providing a table that could be used as display area for the plants and storage for the tools and other gardening essentials.